By some estimates, Intellectual Property (“IP”) represents up to 80% of corporate value. Therefore, knowing your competitor’s innovation strategy is equivalent to understanding their business strategy. The question then becomes, how do we accurately predict a competitor’s innovation strategy? Historically, understanding a competitor’s innovation strategy involved significant time spent researching patent portfolios. The resulting visualizations and graphs, although impressive, offered little useable information. 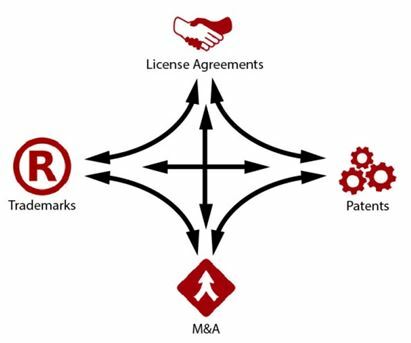 Even if some light was shown on a competitor’s IP portfolio, realistically, patents only represent a small portion of a competitor’s innovation strategy. With the emergence of specialized software and the concept of analyzing big data, today’s CI professionals have significantly greater access to the data sets that provide insight into a competitor’s IP activity. The following article introduces the critical IP data sets, and provides examples of how each can be used to gain competitive intelligence. Additionally, we will look at the benefits of linking these data sets to provide real, predictive value. True competitive intelligence is gained by analyzing a competitor’s decisions to maintain an IP portfolio or dispose of it, to assert a right or not, or to sell or license a portfolio. These are the business transactions that drive a competitor’s value. Only through transparency of IP data can one accurately predict a competitor’s innovation strategy and, therefore, its business strategy. Strategies for gathering business intelligence have evolved over time with the emergence of various technologies and the growing availability of data. What remains constant is that the most successful companies utilize every tool available to protect their competitive advantage and triumph over the competition. In order to effectively monitor IP activity, companies must first obtain solid data on which to base their decisions. While many believe data is unavailable and hard to come by, the opposite is actually true. Sources of available documentation include license agreements, patent filings, trademark filings and M&A disclosures, all available for every industry and in most countries. Each piece is vital to gaining the business intelligence, and creating the transparency, necessary to succeed in today’s highly competitive business environment. Information contained in these individual data sources can on their own provide insights into potential competitor strategies and innovations, but when this data interconnects, a wealth of previously hidden information becomes transparent. Figure 1 demonstrates the interconnectivity of the above mentioned information sources. In order to understand these connections, one first needs to understand the value of these individual sources of IP information, and next need to understand how the data can be connected to uncover hidden information. Taking the extra step to connect the data and utilize its collective insight can ultimately make the difference between success and failure. Professionals generally understand that license agreements exist in the public domain, but undervalue the vast amount of information that exists within these documents. The insight gained by analyzing the content of an agreement is what tells the greatest story. For example, license agreements contain the deal structure and specific deal clauses (including territories where the intellectual property is being exploited), exclusivity rights, termination clauses, and definitions of the deal agreed to between parties for every industry. Additionally, the actual IP being licensed, such as patents or trademarks, is often disclosed within the license agreements offering a wealth of valuable transparency to professionals. As seen in Table 1, by analyzing the license agreements executed by Merck & Co. Inc. and its subsidiaries, professionals can discover who Merck & Co. Inc. is receiving rights from, as well as whom Merck & Co. Inc. is sending rights to. Further, consider the highlighted “ASSET TRANSFER AND LICENSE AGREEMENT” entered into with Guilford Pharmaceuticals Inc. relating to the chemical compound tirofiban hydrochloride. For this transaction, Merck & Co. Inc. received $80,300,000 as an initial purchase price with continuing royalties ranging from 5% to 20% through 2012 for sales within the United States. Along with the terms defined within the agreement, it can, and should, be noted that this compound goes by the trademark Aggrastat(R). An overwhelming proportion of professionals undervalue patent filings, viewing them merely as a means to understanding what innovations a company has developed. While accurate, these professionals are overlooking other valuable patent related information such as patent assignments. In addition to viewing the innovations of a company, patent filings and assignments allow professionals to track where these innovations are being transferred, sectors where patents may be applied, specific claims around the novelty of the patents, and possibly most importantly, who has ownership of the patents. By analyzing patents professionals can find a wealth of information, including what sectors in which a company is innovating. 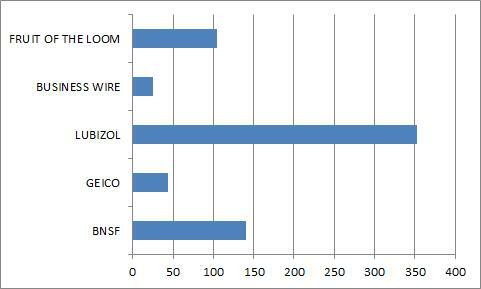 As seen in Chart 2, the acquisition of patents from HP in 2014 expanded Qualcomm’s patent portfolio within sectors they had not previously invested heavily. As such, these patents open up the possibility for Qualcomm to compete against companies long established within these sectors. This information alone can provide professionals insight into Qualcomm’s future strategy, including predicting who Qualcomm is planning to compete against, who may have interest in entering into licensing arrangements with Qualcomm, or who has acquisition potential. Trademarks have not historically been viewed as a viable source of competitive information. Many professionals, in fact, only consider trademarks when detecting potential threats to their brand. In reality, trademarks provide a greater level of insight, allowing companies to learn not only the first-degree business dealings of their partners or potential partners but also second and third-degree dealings. This information can not only predict brand threats, it can be used to help discover potential competitive conflicts and future competitor product plans. Understanding the brand strategies and holdings of companies is vital to competitive intelligence. As companies acquire other companies and industries consolidate, it becomes important to understand who are the ultimate owners of the trademarks. As some companies assign all their trademarks to one larger IP holding company, others may simply let these new subsidiaries operate and manage their own IP. By tracking this information professionals can get a detailed view of corporate structure and the existence of any larger underlying strategy. As demonstrated by Chart 3, in the absence of assignment activity professionals can look to other sources of information to gain competitive intelligence. In the case of Berkshire Hathaway Inc., the acquisition of many of their subsidiaries could remain virtually undetectable. Without viewing the acquisition data, it is nearly impossible to ascertain that Fruit of the Loom, Business Wire, Lubizol, Geico and Burlington Northern Santa Fe are in fact subsidiaries of Berkshire Hathaway Inc., as the trademarks remained within each company, never moving through assignment to Berkshire Hathaway Inc. This information is integral to understanding who a company is competing against. IP professionals look to M&A deals in order to understand the potential market values of companies. If the same professionals were to look at these M&A deals more closely, they would also learn the shareholders of the target companies, the industries in which both companies operate, the IP owned by the target company, potential synergies between the acquiring company’s products and its target’s, and potential insights into the future areas that the acquiring company may be heading strategically. All of this information, plus the final values being paid, is available for further insight into any number of companies and industries. 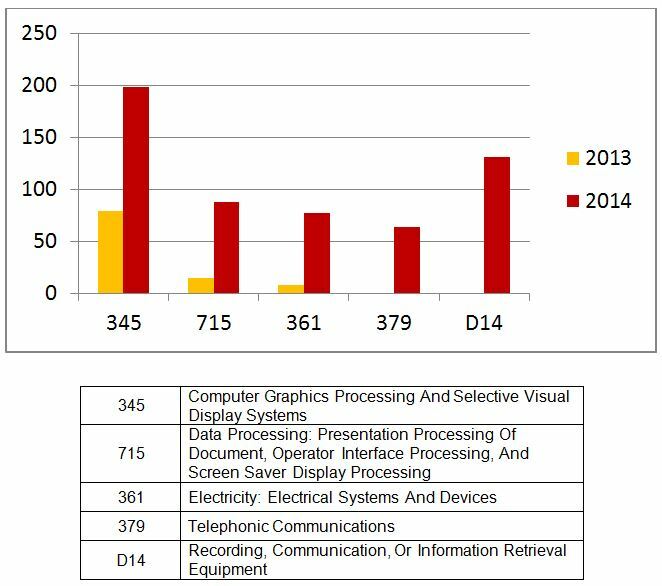 As seen in Chart 4, acquisitions from 2009 to 2013 related to “light emitting diodes” (LED) technology has been an active M&A area, peaking in 2011. On a broad scale, understanding M&A activity trends can have deep impacts regarding a company’s decision to participate in future M&A activity within a sector. By further analyzing these acquisitions, valuable insights into the specific activities of individual companies can emerge. 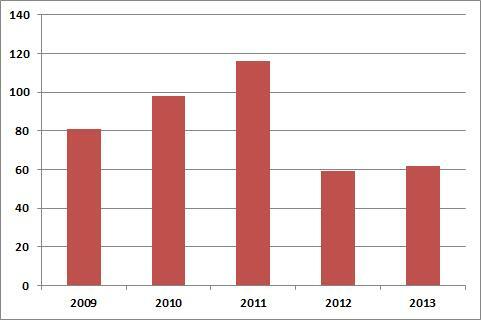 For example, in 2011, Cree Inc. acquired Ruud Lighting Inc. for approximately $525 million dollars. Since this time, Ruud Lighting Inc. has assigned 18% of its patent portfolio to Cree Inc., the remaining patents being held within Ruud Lighting Inc., now a subsidiary of Cree Inc. The acquisition introduced Cree Inc. as a competitor within the outdoor LED lighting product and technology market; a market in which they had not previously been able to compete. Additionally, it should be noted that without understanding the corporate structure following a merger or acquisition, it may be fairly easy to miss the broader portfolio that Cree Inc. owns after acquisitions. As revealed through the individual case studies above, interconnected data is integral to a complete competitive intelligence analysis. Treated as one all-encompassing data set, IP connections open a world of discovery for companies looking to gather competitive intelligence. In practice, interconnected data allows companies to discover a competitor’s innovation strategy, which many companies spend great deals of resources to hide. IP big data allows one to answer questions such as those listed below. Inbound patent activity occurs when a company is granted rights or is the assignee in a transfer transaction. Outbound patent activity occurs when a company assigns the rights to another person or entity. Where is the competition innovating? Figure 3 demonstrates the industry sectors in which Nike has been investing. With this information, companies are able to discern where current competitors are looking to gain a new market advantage, as well as what new competitors are entering the space. Within this figure, one can see the technologies in which Nike is investing, such as recording equipment and equipment for production, distribution, or transformation of energy. Where is the competition divesting? Figure 4 demonstrates the industry sectors in which Nike has been divesting. Companies can use this information to detect competitors’ strategies to leave a market, as an alert that a market is in trouble, or that an opportunity to gain market share exists. Figure 4 shows the technologies Nike is divesting, such as data processing and exercise devices. Who is the competition dealing with? Figure 5 demonstrates the connections between Nike and any other company or inventor. This information allows companies to understand the competitors’ business partners. Often times, understanding these hard to find relationships leads to better prediction of the competitions’ activities within a market. 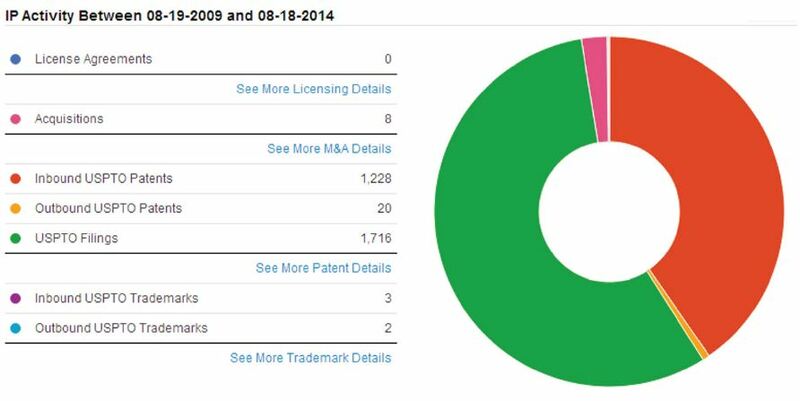 This figure shows Nike’s business partners with respect to any IP transaction or event. What strategic moves is the competition making? 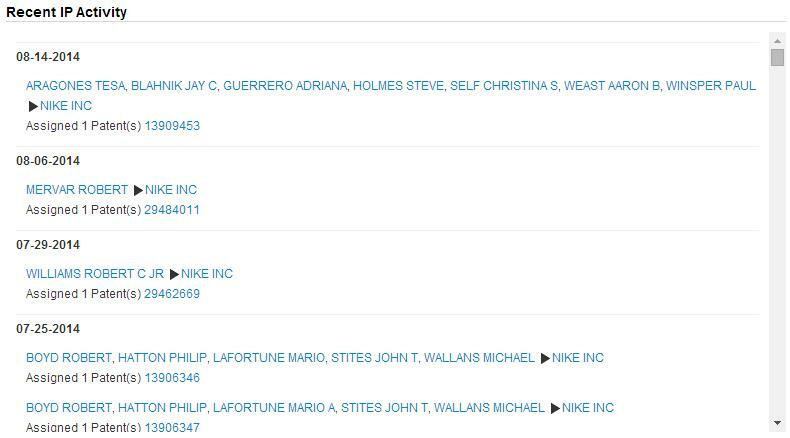 Figure 6 provides a comprehensive listing of Nike’s recent IP activity. This level of information allows companies to monitor the competition by providing the means to stay current regarding any threatening movements. In this example, attention should be paid to the assignments taking place as they may help a company predict a competitor’s impending innovation strategy. An assignment may indicate a new deal about to take place surrounding a particular technology. « You Have a Trade Secret – Now What?